Dolores Danza made her debut last month when she sang the classic tune, “You Are My Sunshine,” and taught the little Mexican kids the words so they could sing along. I just sat back and let her do her thing. 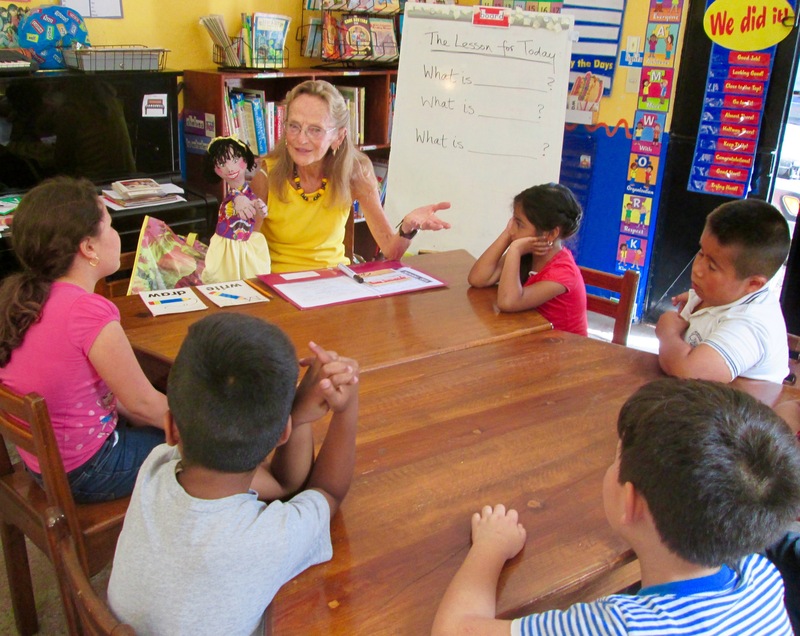 I like having puppets as partners when I teach small children anything, because I can basically melt away. You may recall that I made Dolores this past summer (see my July 7th WOW post, “Puppet Power”). She’d been waiting since then to get to work, and her chance finally came in September, when I learned in San Miguel’s weekly paper, Atención, about a volunteer opportunity at a charming after-school school in Colonia Guadalupe, called Aprendizaje del Inglés, to teach little ones English for one hour, one afternoon each week. What a joy this has been. Dolores and I have been loving it. 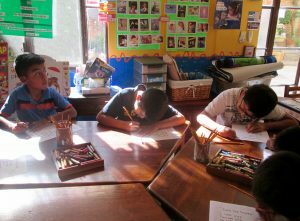 Aprendizaje del Inglés (learning English) was started in 2008 by retired American teacher Linda Curran. 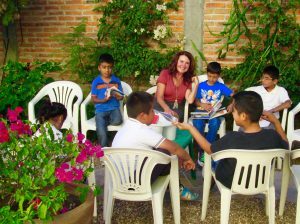 The school, which offers classes to students in primary and secondary grades, Monday through Thursday afternoons, promotes English language literacy through speaking, singing, listening, reading, and writing. 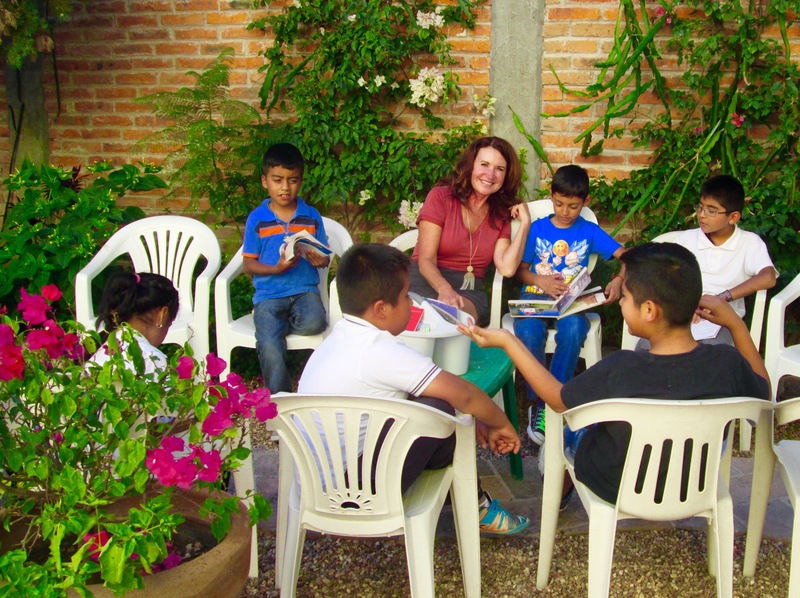 When I arrive at four o’clock on Wednesdays, Linda is in the courtyard with a group of primary school students, helping the children enjoy the basket-full of English and bilingual children’s books, as a sort of warm-up for my classroom lesson. This past Wednesday I brought a new puppet-creation I named Jake the Snake. He’s made of a knee-high sock and has (of course) no arms or legs. He told the kids that he likes to eat mice (“They’re nice!”) with tortillas and rice (“with spice!”). He’s a harmless snake, I explained, because he has no fangs, and he has a rounded head. (Snakes with triangular heads, I learned in doing my research, are the ones to seriously watch out for.) I gave the ninos a worksheet with the new words, plus drawings of a snake and mice for them to color. I’m not at all sure who has more fun with my puppet partners, the kids or me. What I am sure of is that I’m immensely grateful for this delightful opportunity. And I’m learning a whole lot. This week I learned the Spanish words for snake, mice, nice, and spice!